Home Cabarets & Shows Oh My God She's Parisian! You’ve always wanted to know more about the much-admired attitude and lifestyle of Parisian women, so snap up a ticket for ‘Oh My God She’s Parisian!’. Because Julie has lived in London, Chicago and New York, but she has always remained a true Parisian ... She decided to leave the Legal Department of a large company to play in the first one woman show about a 100% Parisian women in English. You’ll be won over by her: getting up late, struggling through the crowds in the metro at rush hour, juggling a career and family life, having a quick drink and doing some shopping, preparing a meal with friends, going out clubbing ... Come and experience a hectic day in Paris with Julie! 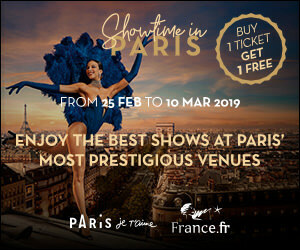 Encountering the various characters played by Julie Collas is a hilarious experience: the audience laughs at the foibles of Parisians and revel in Julie’s delightful French accent … A show for everyone. A joyful show not to be missed! Please note: No changes or cancellations for this show.